Sometimes drivers do not install properly and can cause numerous issues with the functionality of your device. This is usually caused by certain files not being overwritten properly, or older files from previous installs causing conflicts. In most situations, you can just run the Univeral Control-AI installer and let it overwrite the previous version. Sometimes though, it is necessary to manually remove all traces of any Firestudio, Universal Control or Universal Control-AI related files that you may have on your computer before doing a fresh install of Universal Control-AI. *NOTE: Because Universal Control-AI shares some files with the original Universal Control and Firestudio family, it is not possible to uninstall Universal Control-AI without also uninstalling the original Universal Control and Firestudio related drivers and software. All files will need to be removed, then you can re-install Universal Control and Universal Control-AI as needed. We now have an uninstaller for OSX (10.7 and later ONLY) which will remove all Firestudio, Universal Control, and Universal Control AI related files (just as a manual uninstall would). It comes packaged as a .zip file. Simply download it to your desktop, double click on the .zip file to unzip it, and then double click on Uninstall Universal Control AI to run the app. Follow the directions, and when it has finished, click Quit to exit and then reboot your computer. Once you have uninstalled and rebooted, you may re-install Universal Cotnrol AI, either the latest version available or the specific version you've been instructed to install by Tech Support or a related Knowledgebase article. 1. Disconnect your FireStudio Family interface and make sure neither Universal Control or Universal Control-AI are running in the dock. Quit them if necessary. 2. Double click on MacHD to launch a new finder window. The following list includes every possible Firestudio related file that may have been installed on your Mac, depending on which driver versions you have installed previously. If you do not see some of these files, it's not a problem. The files are listed by location tree. For example, to locate the MacHD/Library/Preferences/PaeFireStudio.startup file, you will double click on MacHD and Open the Library folder. In the Library folder, you will open the Preferences folder where you will find the PaeFireStudio.startup file. This is the file you will move to the Trash. In the folder that opens, find the files that have Universal Control in the label and move them to the Trash. And again, if you do not see some of these files, it's not a problem. What files show up will depend on which versions of Universal Control you may have installed previously. Release the keys. At this point, your computer should be completely zeroed out and you can reinstall. Go to https://my.presonus.com and log in to your Presonus User Account. Once you're logged in to your account, in your My Hardware section, find the listing for your StudioLive AI mixer and click on it. The latest driver and software downloads for your mixer are available for download here. Click on the Universal Control AI with drivers and VSL AI for your Operating System to download it. **NOTE: The exception to installing the latest driver for your device would be if Tech Support or another Knowledgebase article has instructed you to install a specific version other than the very latest. Once downloaded, run the installer, and reboot once it completes. How do I access Software and Drivers for my StudioLive, StudioLive Ai or Rack Mixer? 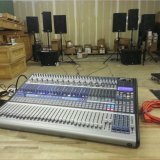 How Do I Backup the settings on my StudioLive AI board?